Tony writes: A recent conversation with a friend about my trips to the Asian market turned into a drawn-out discourse on what I buy there (a handful of standbys accompanied by as much aimless wandering as my day affords), how I prepare it (mostly stir-fries and quick braises), and whether wasabi peas are baked or fried or really peas at all for that matter (no idea). I had to go, so I promised to cover here what I’ve learned from my bi-weekly market forays. Maybe it will help you get past the fear factor and into the market or maybe it will just prevent you from wandering the snack aisle, mesmerized by those weird Japanese gummy fruit things. My advice is a two-pronged attack: go with a basic idea of what you want and then plan out what you’ll do with the haul once you get home. The latter is important: you want to buy stuff you actually intend to use; or else risk a neglected pantry like mine, full of tapioca flour and cardamom pods. Here are some brief explanations of what I normally buy as well as a basic recipe for my favorite tofu standby. 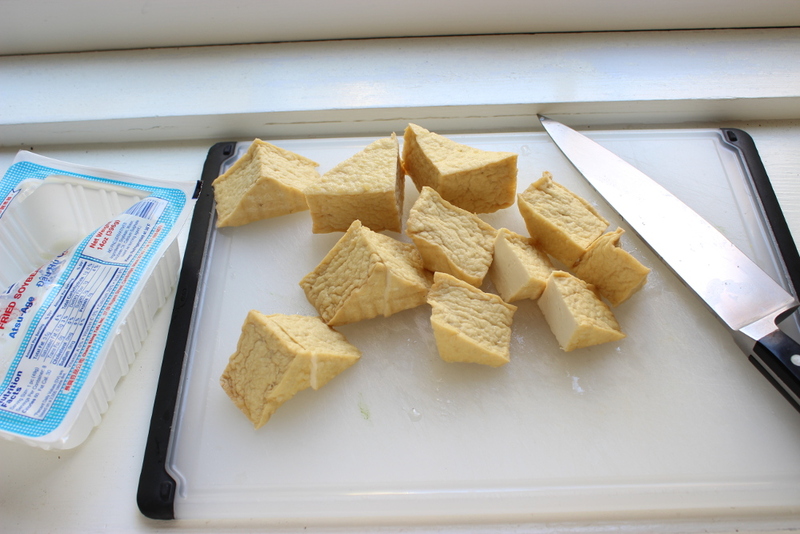 Pre-Fried Tofu: I know. 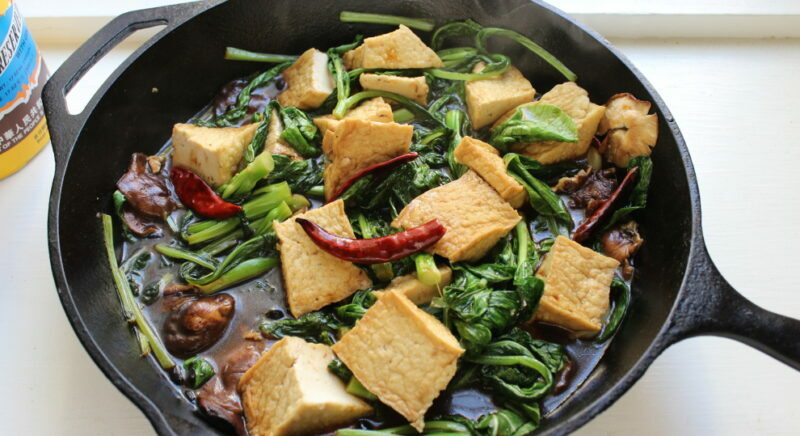 Most of us don’t have fried tofu on the list of things-I-have-to-work-into-my-diet. But these 1-inch triangular pieces have all of the proteins and nutrients as regular tofu, without packing much additional. It’s also got a nice, meaty texture that’s great in quick stir-fries. It holds for about 2 weeks in the fridge (check the sell-by date), making this a great ingredient to buy and plan on using whenever you want to go with a light vegetarian meal: pair with something green like Chinese broccoli or Napa cabbage and some sort of quick sauce (see below). Chinese Black Mushrooms: Chinese black mushrooms are shiitakes for all intents and purposes, but have a fatter, more rounded cap than the conventional shiitakes (sold in 3.5-oz packs) at your local supermarket. They have a wonderful meaty texture and umami flavor; their only drawback is that they can spoil kind of quickly; after 3 or 4 days in the fridge, their texture can become mushy and smell a little sour. To cook with these mushrooms, stem and thinly slice for stir-fries or slowly braise with pork or beef. Noodles: On most Asian market visits, I pick up fresh rice noodles or udon noodles or both. Fresh rice noodles come in 6-inch sheets which you can cut into 1-inch strips and stir-fry as chow fun, my favored order in Chinese restaurants. Though these noodles may be firm in the refrigerated case, they soften into chewy strips upon stir-frying. Fresh udon noodles are also a good purchase, far more delicate than the dried stuff. Before adding to a soup or stir-fry, boil until tender and then drain under cool running water to rid them of their surface starch and set their texture. Asian Greens: There are at least a dozen versions of choy, or Chinese cabbage, at most Asian markets. If you’re lucky, there will be a sign in English as well as Chinese to help you put a name to the shape and color of each. This can be a problem, too, though, as different markets will name the same thing differently. 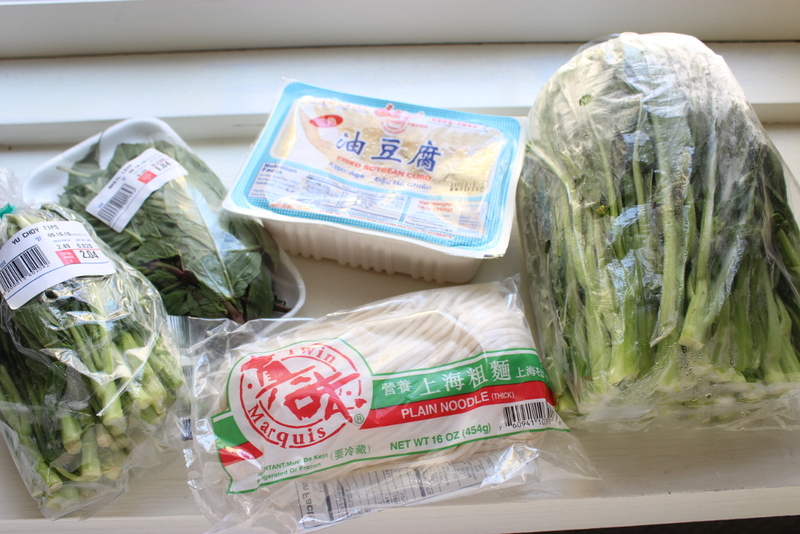 My purchases vary between Napa cabbage, Chinese broccoli (or gai lan), and baby boky choy (look for ones with the lime green stalks with which tend to have a firmer texture). 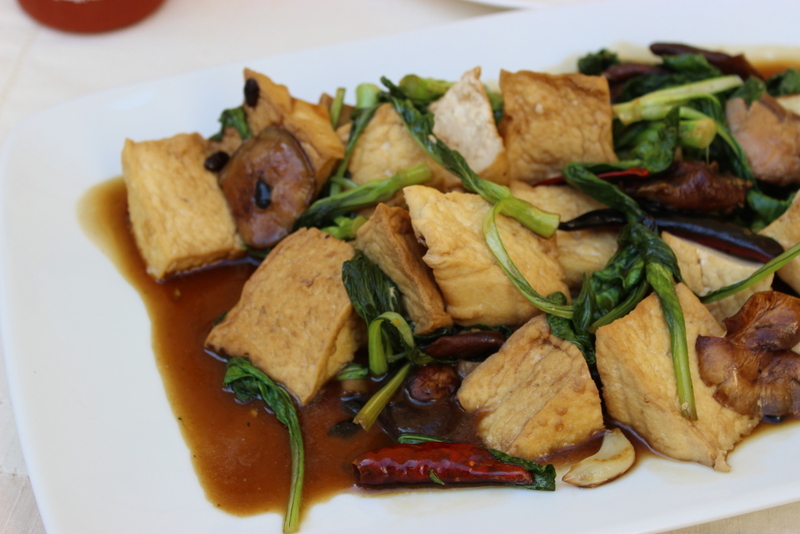 Spicy Stir-Fried Tofu with Black Mushrooms and Napa Cabbage: I make some variation of this dish about once a week. The primary ingredients – cabbage, mushrooms, and tofu – all hold in the fridge for a couple of days, so you can just pick them up and then prepare them on the kind of unattractive evening that you’re willing to cook, but only barely. 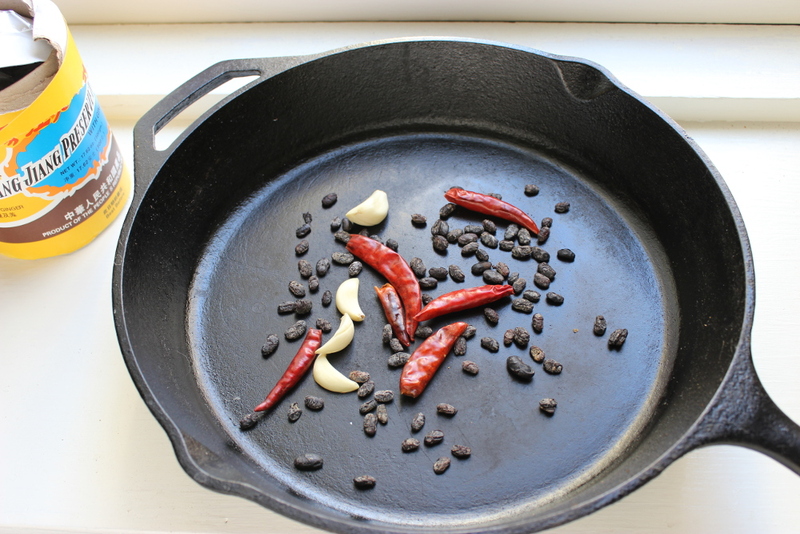 To make the dish, heat a large skillet or wok (I use my cast-iron skillet) over medium-high heat. Add a good splash of canola or peanut oil as well as a few smashed garlic cloves, a couple thin slices of ginger and fresh or dried chiles (the amount to suit your temperament – I like leaving Thai chiles whole). Cook, stirring, until the aromatics sizzle steadily and become fragrant, 1 to 2 minutes. 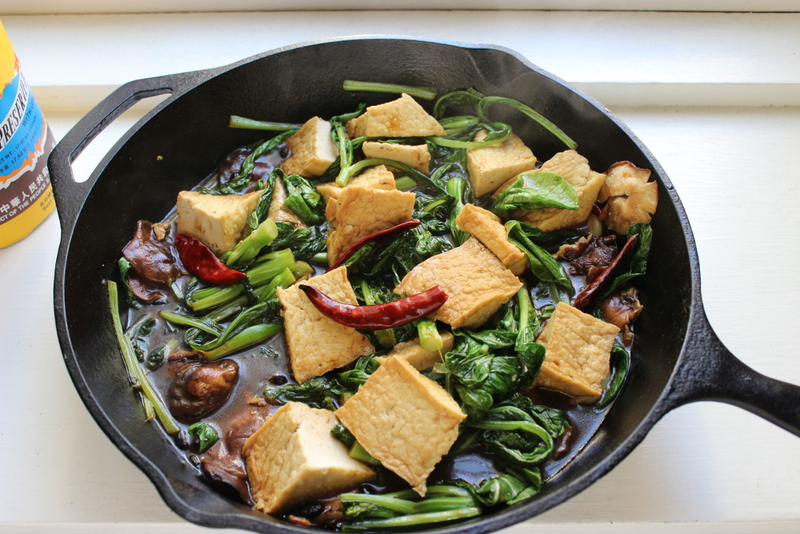 Add the tofu (cut it to the desired size), 1/2-inch pieces of Napa cabbage (just slice it crosswise 1/2 inch thick), and some thinly sliced black mushrooms, sprinkle lightly with salt (to pull out some of the moisture from the cabbage), and cook, stirring, until the cabbage wilts and the tofu heats through. Whisk together a light sauce (I like a pairing of oyster sauce -go very light here and look for the Lee Kum Kee brand – sesame oil, soy sauce, white vinegar, and soy sauce), stir it into the stir-fry, toss until all the flavors come together, and serve with steamed rice or stir-fried noodles.